Ah, you've sent me a friend request. You want to be friends. I don't think the word friend means what you think it means. Because the word *friend* implies that you like someone, you know, you enjoy their company and like being around them. Which is why I'm wondering -- the reason you're asking to be friends with me. Last I heard, there was a lot a lot a lot a LOT about me that you didn't want to be around. And absolutely not that I'm holding grudges, or am in any way still sore about the reasons you gave for having to be free of my presence. But your request for friendship makes it clear that you need a few reminders. Are you sure you want to be my friend? I feel it my duty to refresh your memory, remind you of the reasons why I would suggest you think harder about what you're asking. Let me help you revisit your feelings on this one. Like, how are you now, and how would you be, about the way I can slam down a hamburger faster than you? That dismayed you a bit. How I remember, you just couldn't stop telling that little bit of trivia to anyone that would listen. Tsk Tsk, food shaming. And I'm sure you'll want to know, your concern about my *book problem. * Yup, still addicted. You can't even see the wood of my coffee table. I also still walk everywhere, and I know how you feel about that. Your jokes about driving the car to the bathroom if you could. I didn't think you were ever joking. My feelings would still get hurt, just as they did a century ago, when you'd ask, "Wanna see what our kids would look like?" Then you'd show me a picture of lemurs, something that would send you into conniptions over and over. Yes, humor is subjective, but some stuff is just never funny. Let me check with you on something else, too, do you still think everything is because of hormones? And do you still ask, "Is this because of hormones?" You do? Okay. Thanks. I've got some questions, too. Do fur bikinis with fur Russian hats still top your to die for fantasy requests? Know what? Never mind. Forget it. Let's be honest, *friend* I think it's pretty clear. You don't really want to be my friend, do you? You just want to see how things turned out for me. Well, let me tell you so you don't have to friend me to find out. I'm writing this to you while cheeseburger juice is dripping of my chin and onto my fur bikini. 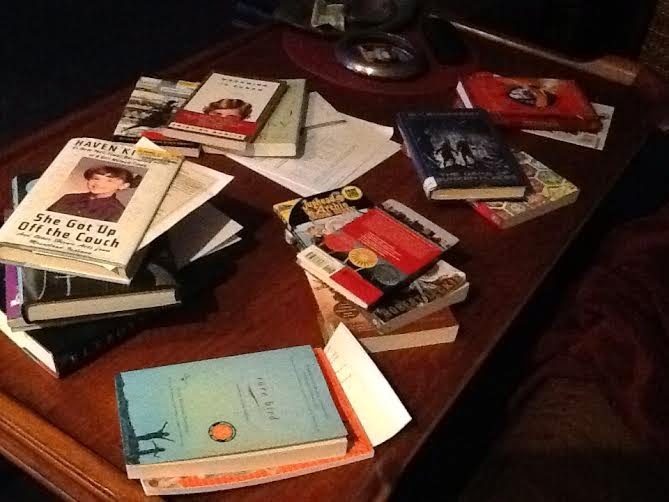 I put aside my stack of books to answer your request honestly, though I'm in the middle of a PHENOMENAL memoir. 450 pages. No pictures. It's about, ah... there I go again. Can you say Book Problem! I'm sorry I can't write longer but I've got the cutest pack of lemurs jumping around me right now. So, gotta go. Take care! I wish you luck, with your other friend requests I mean. I hope you found a place with hallways wide enough for you to drive yourself to the bathroom! So glad we had this chat so we could avoid any possible future messy business. Just think of how you'd have to maneuver your little indoor car around my stacks of books. Anyone who isn't falling all over themselves to do right by you has more than just an unanswered friend request to keep him or her company in the panic-y, wide-awake-at-three-am moments. I'm guessing the demons in that non-friend's closet are large, hairy, loud, and halitosis-ridden. I was just wondering about some of the friend requests I get on FB and Twitter. I keep thinking, do you people actually read my bio? You're going to hate having me on your feed. Are you just looking for a fight or what? And we should totally eat cheeseburgers together some time. That's it, B. Undeserving crowd. NO, with a capital N.
I'm glad you let me be your friend. My love for books overrides my hatred of burgers. Fur bikini, huh? That's pretty specific. Just the thought of it gives me a rash. Thank you, Nicole! Going to look you up now and THANK YOU for visiting! Oh, I heart you.... And I always wonder about FB requests from people who REALLY didn't want to be seen with me back when. Hope you are enjoying your cheeseburger and beautiful children who don't look anything like lemurs. Tsk. I tried commenting the other day but I think it disappeared unless maybe you have comments moderated. I think it went something like I loved this post. Because I did. I do. "The cutest pack of lemurs"....you are awesome.